Credit is built to solve the absence of PayPal Adaptive or Stripe Connect working with Escrow system in FreelanceEngine in some countries. With the Credit, users can add fund in their account & later they can make any transaction on the site by using credits instead of the usual money - based methods. To use Credit as a payment gateway for each transaction on your site, you must activate FrE Credit plugin and setup Credit system. 1. FrE Credit plugin: In Dashboard, go to Plugins setting page to activate this extension. - Use credit system: You must enable this feature to allow users to use credit system on your site. - Prevent access to the deposit page: This feature permits you to prevent users access to deposit page on your site. - Secure code: You can enable this feature to turn on the secure code requiring for each credit transaction on your site. - Deposit page slug: You can set page slug to deposit page. 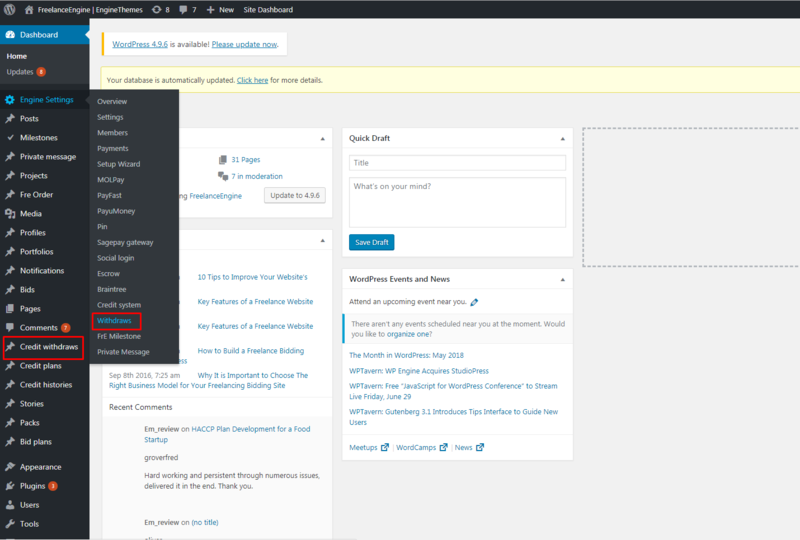 Then, set up the deposit page slug by selecting a page in the dropdown menu (only pages having shortcode [fre_credit_deposit] are displayed). - Admin's email who will receive notification: Enter admin's emails to receive the notification for each action on your site. - Minimum money in each withdraw process: You can set the minimum money required for each withdrawal process in this field. In case you do not set this field, the default minimum amount for withdrawal is 50. It means user cannot withdraw money if his available balance is smaller than 50. - Credit plan: Create different pricing plans for employer to buy credits. - Mail template: Admin can create and manage mail templates for new messages involving each action on the site in this section. 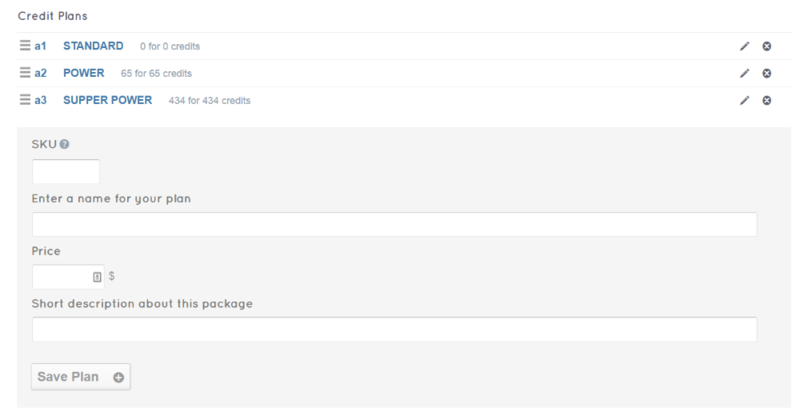 - Approve the payment when user buys credits so that the credits appear in the user’s account ( Engine Settings > Payments). 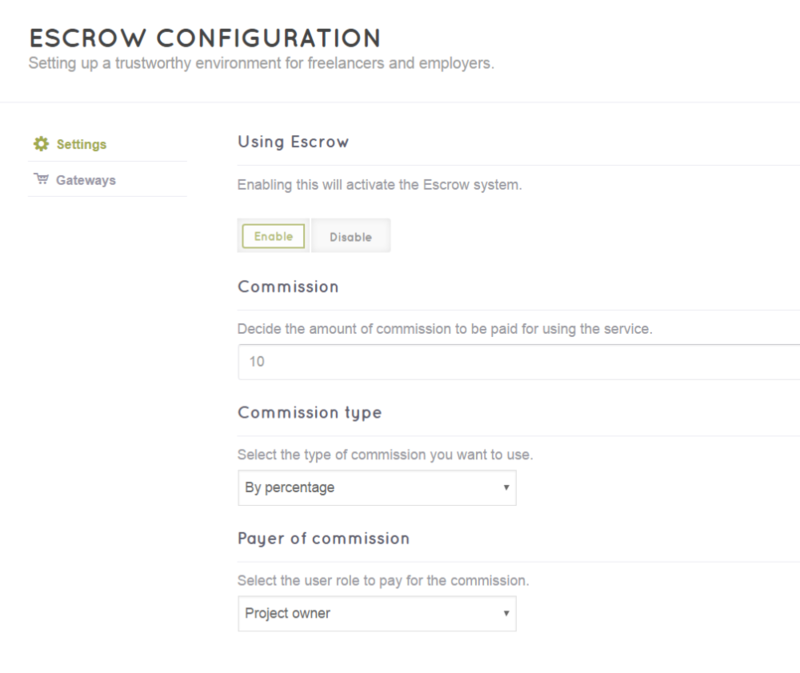 You can find the Escrow system’s setting page in your admin panel. Choose Engine settings > Escrow to set up Credit. - Using Escrow: You enable the Escrow system in this section. - Commission: This commission is the fee users have to pay for using your service. Simply insert the amount of commission you want to charge them. Besides, you go to Engine settings > Settings > Content to set up the currency. - Commission type: You can select the type of commission you want to use in this section. There are two types for you to choose: by percentage or by a specific amount. - Payer of commission: The employer is often the person who pays the commission. However, you can select the freelancer to be the payer. - Payment Test Mode: You can either enable or disable test payment without charging your account. - Manual transfer: If you enable this option, you can manually transfer the money when the project is done. - To use Credit as a payment gateway working with Escrow system, you have to enable Credit system. *Note: When you select credit system to work with Escrow system on your project bidding website, PayPal Adaptive and Stripe Connect must be disabled. 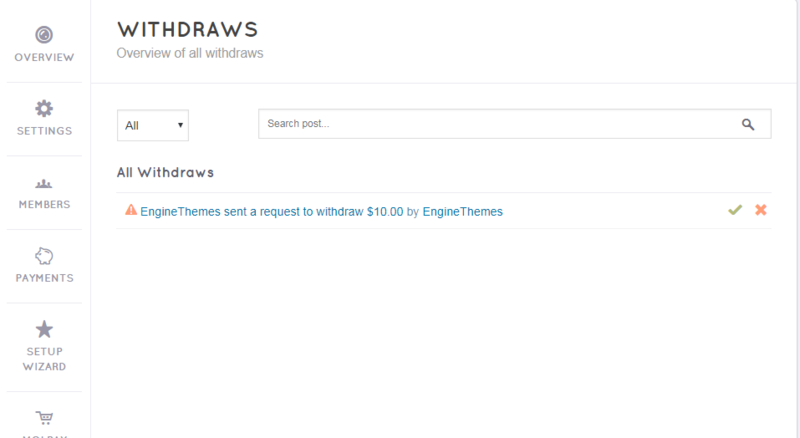 - When users make withdrawal requests, site admins will receive an email notifying about the credit withdraws. - As a site admin, you will navigate to Engine Settings > Withdraws to check or confirm the requests. Here, you can click on each request to be redirected to the information. After you have manually transferred the money, you can approve the request. Or you can decline it in the first place if the user has violated any policy.